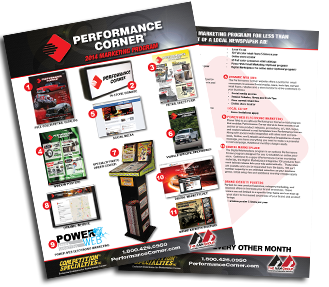 Performance Corner® is the Industry’s first full featured marketing program for traditional auto parts stores and specialty shops. Established in 1985, Performance Corner® now has over 300 member stores throughout the West Coast, backed by the expertise and marketing power of Competition Specialties Inc®! View the PDF to the left or visit the Performance Corner® Website to see what this great program has to offer.